The majority of the Medjugorje things to do involve activities and sites established to commemorate the appearance of the Virgin Mary in 1981. 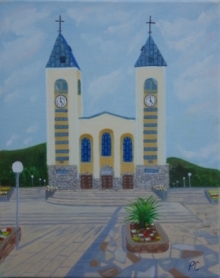 This is a small town in Herzegovina that became a major tourist draw; thousands of people travel to Medjugorje in pilgrimage. Many people travel here to be healed, as several supposed miracles have occurred. There are several walks that will take you to the holy sites and shrine. Apparition hill is where the apparitions supposedly occurred, and you can follow a steep path up to the main site. There is a large cross and statue at the spot where tourists have seen the Virgin Mary. Lining the paths are bronze reliefs that depict the different mysteries of the Rosary. At the very foot of Apparition Hill is a Blue Cross where a prayer group gathers regularly. Many people do the walk up the hill in bare feet to show their devotion. A longer walk is up Cross Mountain, which has a cross at the peak. There are also many relics on the cross and many people will assemble at the top for an early morning mass. There is a special mass the first Sunday after the Feast of the Nativity. The path up Cross Mountain also intersects with the path up Apparition Hill, and you can easily do both in one day. If you are looking for something a bit more thrilling, look into a rafting adventure at the nearby Boracko Lake. Neretva Canyon is one of the best places for rafting and there are several companies that offer a full day rafting tour. This spot is pristine and a great way to experience the beauty of nature away from the main tourist areas. Travel to "Ronjenje" for a scuba diving adventure. You don't need to have passed the open water PADI course, because the instructor will take you through everything you need to know for a day of diving. There are half day and full day diving excursions and you can rent all the equipment you need. Some of the diving spots include Kluda, Brac Island, Ciovo Island, Solta Island, Vis Island, Hvar Island and Kraljevac. Take a quad bike for some exciting adventures in different terrains. The ATVs will allow you to travel along the mountain trails and you can see some beautiful scenery.